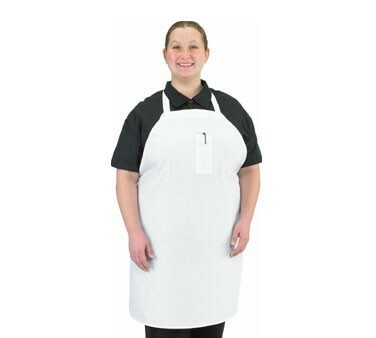 A must-have in any commercial kitchen, the Chef Revival 610BAC Economy Cotton Bib Apron with Pen Pocket provides full coverage against spills and stains and has a sleek and clean look. Tailored with a pencil pocket, this apron provides ample space for storing a pen, pad, and other small kitchen essentials. Thanks to its 100% Cotton fabric, this bib apron is comfortable, exceptionally durable, and easy to clean.